Good morning! Time for another sketch at the Waltzingmouse Sketch Challenge (WMSC35). 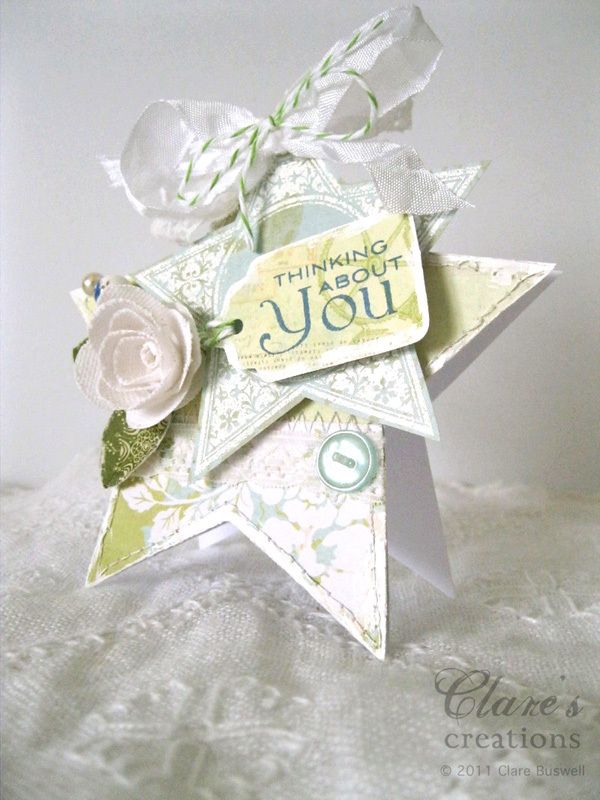 I've never made a star shaped card before but I really like how this one turned out. Here's this week's sketch. I also combined this week's sketch with the color challenge at the Color Throwdown #129, I love this color combo, it reminds me of spring! I used some pretty papers from the Prima Botanical Collection and Papermania Rose Garden. I used some Webster's Pages for the leaves. The stamped star is from Seasons of Love - Tags from Waltzingmouse Stamps, I embossed it in white. 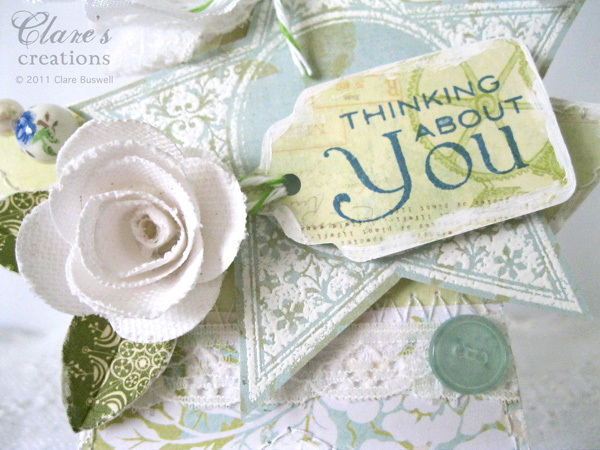 The sentiment on the tag is from Fancy Phrases also from Waltzingmouse Stamps. The flower I made from canvas using the Sizzix Bigz Die Flowers 3D (randomly my lovely Niall brought me home a roll of canvas the other day, at first I wasn't sure what to do with it but I'm loving playing with it!!) The trinket pin with porcelain bead I made. I added some seam binding, lace and apple/white baker's twine to the top. Don't forget to check out the rest of the Mischief Maker's creations along with some of the WMS DT at the Waltzingmouse Sketch Challenge. Enjoy the rest of your weekend!! Other: Canvas, white acrylic paint, sewing machine, die-cutting machine, Sizzix Bigz DIe Flowers 3-D, Scalloped Tags Die, button, white seam binding, lace, apple/white baker's twine, hole punch, trinket pin, white embossing powder, heat gun, foam pads. Wow!!!! So shabby chic - so feminine, soooo pretty! Very pretty, love the stars together, and the little details are so pretty. Absolutely beautiful! Very pretty canvas rose. 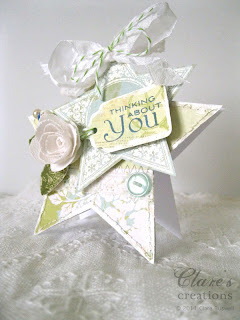 Excellent idea to make your card in the shape of a star. Oh my!! This is Sooooo delicate and beautiful!! I absolutely adore it. 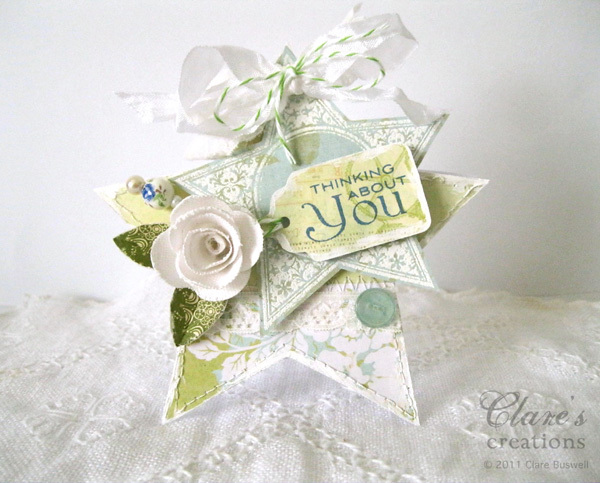 Love your layered stars Clare! and your papers and colors are so pretty! Wonderful flower and pretty bead - is there anything you DON'T make?!?! LOL!! Beautiful card! Always a delight to visit your blog! This is beautiful! How fun for someone to open an envelope and find this! This is gorgeous, Clare! I love the double-up of stars and the colors are so light and airy! So pretty!! Wow...Clare this is so pretty! 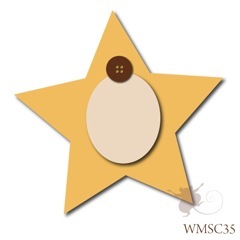 Cute card...love the soft colours. Just gorgeous in every way! That is a gorgeous piece of art and congrats on being picked as the featured entry for Color Throwdown!! !